After what has seemed like the longest winter ever, spring is near! Soon, Albertans will be flocking to the mountains and lakes to enjoy some down time with family and friends. Be sure your recreational vehicle is ready for the season, and that includes a comfy mattress. There’s nothing worse than tossing and turning on a lumpy mattress when you want to be up and out early. Whether it’s hitting the golf course or taking a raft down the river, you want to make sure you get the best sleep to maximize your time outdoors. That’s where our team at the Sleep Boutique can help. The Sleep Boutique hand crafts all of our mattresses and we can help you determine the best choice of materials for your trailer, fifth wheel, class C motor-home, tent trailer or horse trailer. 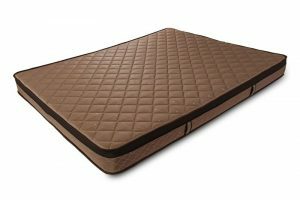 Since everyone has a different preference on their desired comfort levels, there are various options to consider in our foam mattresses and spring mattresses. Another consideration is how often you use your RV. If you are a snowbird who is on the road for extended periods of time, it is a good idea to get the rv mattress with heavier foam, as it will last much longer. We recommend at least 2 lb foam for snowbirds, while people who use their RV for less than 30 days a year can easily get by with 1.5 lb foam. Once you select the best option, we will manufacture your custom mattress onsite and within an acceptable time frame. You will be ready to hit the road in no time! We do remind our customers that an important task to complete prior to coming in to see us is measurement of the mattress and bunk area. Be sure that you are careful with the measurements, including curves, as this will ensure we manufacture the right size. We can also replace the foam in your RV cushions or you can choose new material from our vast selection of fabrics. If we don’t have just what you want, you are welcome to bring in your own fabric as well. Then, we will sew and stuff your new cushions to your specifications, including bolsters, odd shapes and hinges. If required, we can talk about other options like replacing the foam in your sofa cushions with firmer and denser foam as well as polyester wrap and stuff. Do you need a bench or window seat cushion? No problem, we build in many different styles including wrap, vented, centre pipe and double piped. And don’t forget about the boat! Comfort is just as important when you’re sailing over the water on a sunny summer day. We can help with any custom shapes or hinged cushions for your boat. It’s time to hit the road and have some fun. Play safe and sleep well!